I knew he was excited, but let's face it-- the traditional uniform of the four-year old, a t-shirt and some form of brightly colored pants adorned with the likeness of a favorite cartoon character, is hardly restrictive and could probably pass for pajamas most of the time anyway. 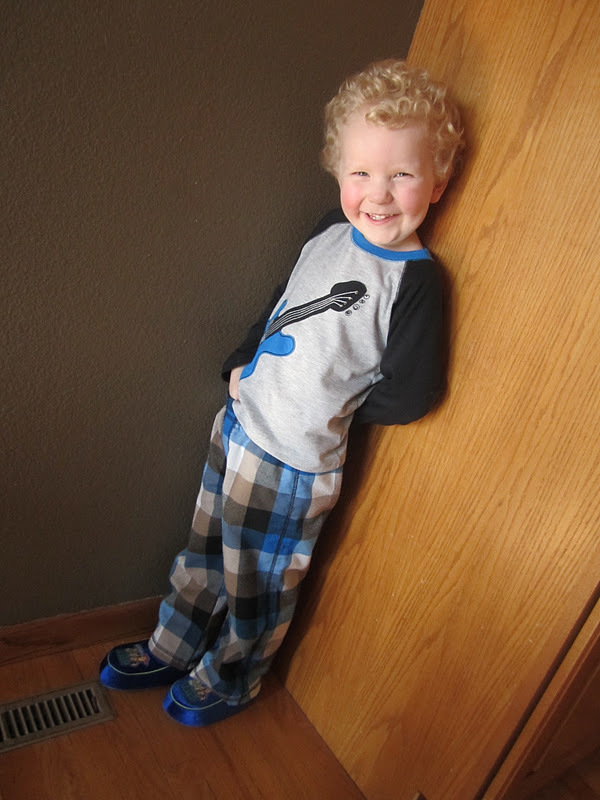 But with his best buddy Bloose at his side and wearing his ridiculously too-small Toy Story slippers, Cael was ready for a party fit for his dreams. He was so excited, in fact, that he couldn't quite wrap his head around what was to come. "Mommy, are all of the kids going to wear their peejees?" "If they all remember, they will." "I don't know if they will. You'll have to wait and see what they're wearing when you get there." "I'm sure they will. 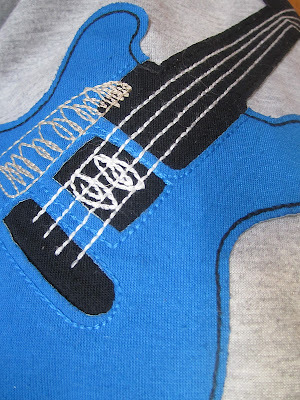 Maybe they have guitar peejees like me." "Cael, grown-ups don't usually wear pajamas like yours. Actually, a lot of grown-ups just wear t-shirts and shorts or sweat pants to bed, like me." "Does Daddy wear guitar peejees?" "Nope. Daddy just usually sleeps in his underpants." "WHAT? In only his underpants?" "Yep. He's under the covers so he doesn't get cold." "I think I should just wear my underpants to school today!" "No, that's not a great idea. You'd get cold." "But I'll have my slippers so that my toes stay warm." "I think you should stick with what you're wearing." "Okay. I'll wear my guitar peejees and my teachers can wear their underpants! Yea! My teachers in their underpants!!" I have a couple of cute pics of them together. I think they both had a blast!